my favorite award of all time 😂 thank you Feedspot! 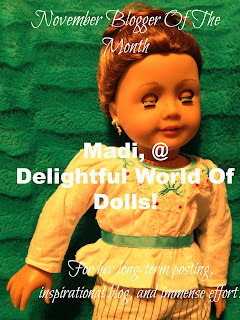 Thank you so much to everyone who nominated/awarded Delightful World of Dolls. It seriously means the world that you think of me! OMGumdrops!!! I wear glasses; I grew out my shiny dark hair for Locks of Love; FYI the minimum is 10inches I believe and i still have the postcard thank u thing they sent me And…. I am an agfan tooooo !!!!!!!! That is so cool how we have so many random facts a lot! Oh, thanks for telling me that. I think my hair is long enough. 😀 Haha! AG Fan’s rock! Hey Madi! 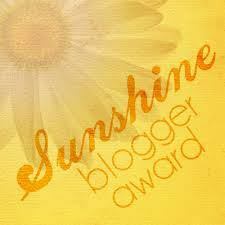 I saw that comment on my blog about winning the Sunshine Award and I’m so thankful!! 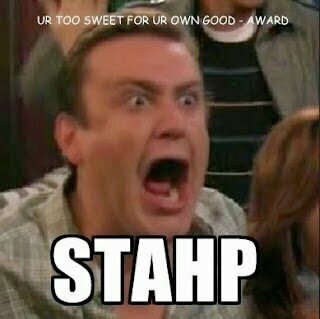 I made my thingy about the award. 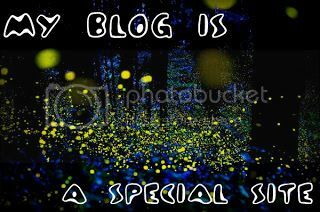 I couldn’t think of 5 other blogs so i stated the facts and did the questions. 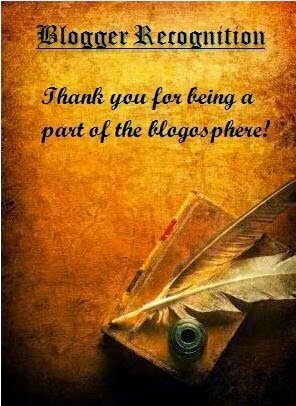 Thank you so much for choosing me!! I made a new post right before I read that so I’m extra excited for you to read the new post! Anyways, I nominated you for the Darling Doll Blog Award and the Summer Bucket List tag! That was soooo interesting to read what you said! I loved that! Thanks, Kathleen! I’m really glad you find it interesting 😀 I like to read what other people say on awards, too. BTW, I doubt your parents would let you watch the Ecliptic Curse. I watched the first two episodes, and, yeah…..it talks about Salem Witch Trials and acts like they’re all witches, and…yeah. I don’t think I’ll watch any more. I mean, I know I’ve said how much I love Harry Potter, which they also are witches and wizards in, but it’s a completely different feel, and I think this will be just as dark as HP #7, which, if anyone is wondering, is dark. Also, speaking of HP, are you allowed to read it? Also, did you know that she is Christian and made Harry Potter to essentially be Jesus, but to be a Jesus that is actually kinda a realistsic person, and not the whole “out of this world (which he is)” thing? Ok, I’ll stop talking about this now, because I know that I’m one of the majority of Christian people who read your blog, and I know some of them are not allowed to read it. I’m not allowed to read Harry Potter, and it doesn’t interest me that much anyways, so I’m ok with it. 🙂 My sister has read it though, and she likes it. She’s seen all the movies as well. Ok, I wasn’t sure. 🙂 I would say that they probably wouldn’t like you to watch the Ecliptic Curse then, cause….yeah. I don’t think I’ll be watching it, either. You should! It’s hilarious! Claire and I cannot stop quoting it! Haha, yeah. I don’t even know what that is. XD. That one is 19D+C, and it is absolutely hilarious! Yes! That’s the one! I really want to watch it, it looks cute! Ah, ok. That makes sense. I’m probably the only one of my friends (not my older friends, but the ones my age) who is really allowed to go on Youtube. Honestly, though, I’m not very phased by any of it. I was in public school for 5 years, and have known lots of bad words and whatnot from that, so… Yeah. There are definitely some weird ones though. I think I’ve seen like two-ish inappropriate ones. Also it annoys me when the things pop up after you watch the video. That’s why when I post my stop motion I’m going to upload it directly to my blog, not through You tube. IDK if I’ll get a Youtube channel or not, honestly. I might. Yeah, it annoys me when videos pop up after I watch them too :p. If you do get a YouTube, what’ll it be about? Hahaha! No problem! I ramble too. XD. I was looking at AGSmiless and saw that but didn’t watch it because I had a feeling that it was wrong…I stopped watching Aspen Heights because of that. It was really interesting but parts of it felt just completely wrong inside of me. Yeah, I don’t think I’ll finish TEC. I personally have no problem with watching AH. I’m very into fairy tales and magic, not as something real, but as something imaginary, which I know makes a lot of people kinda raise their eyebrows, but….hey, I’m a tween girl, I don’t personally think it’s a big deal if I like magic, as long as I know it’s imaginary. Yeah, it’s SUPER interesting. Have you read the Dear America book about it? I just finished it the other day, and it was quite good. Oh, yes, now I want a historical from that time….I’d probably have to wait a few years to make a custom, though, cause my sister isn’t really allowed to read about that, and we share all our dolls. Oh, and I realized that it sounded like I was saying that it’s ridiculous for people to not be allowed to read/watch things related to magic, which was not my intention. I completely understand that. I merely meant that it varies what people feel comfortable with their children/themselves reading/watching. 1. I am very tall. 2. I will sing at random moments. Literally. Either it’s just humming a tune I know quietly, or if I feel comfortable, just burst out in a loud random song. 3. I’m not bothered by gross stuff. 4. I am very picky and decisive about what I wear. tall, randomly belches out Let It Go, picky about clothes (well, I’m not really picky I don’t really care about clothes, but I kinda like a specific style and it’s really hard to find clothes that are both modest and are in that style), and writing. Hahaha wow! And yeah, it’s hard to find clothes that are both modest and that I like, it’s hard to find really good stuff these days. LOL! That’s awesome you write stuff in your head too…..I thought I was the only one! I get mostly handmedowns because I don’t like shopping for clothes…and I really don’t like all the immodest clothing, like everyone wearing ripped up jean shorts…it’s like people ‘modesty is the best policy’ LOL. Exactly, it’s hard to find modest clothing these days :-(. I write stories In my head to. I was making one about this girl who loses her puppy. You do that too? Haha! Small world isn’t it? Oooh! That was really cool! Once again I find even more similarities, haha. I love acting! I don’t take classes, either, though. Thanks 🙂 Yay, another acting-loving-person! XD One of the ways I “Act” is through my dolls – AGSMing. It’s kind of like, acting for me, but I get to play all the characters because I do their voices. Haha, yep! That’s exactly why I like it! Plus, they don’t complain…. Haha, that’s funny! Is your parakeet a girl or a boy? A boy. SO. LOUD. LOL, it was my grandma’s but he didn’t like the chirps so I got him. *grandpa’s! My grandma W passed away on Easter, it was hers too. HI Madi. I saw that you wanted a Westie named coconut. I have a Westie and I have the AG coconut dog. I recommend getting a Westie if you want a dog. Mine is a boy named Skylar. Westies are very soft and cuddly and make you feel better when your sad. I hope one day you can get a dog. Bye. Hi Madi! Westies are very playful and fun. They are kind to everyone. They are not viscous at all. They sometimes will try to do tiny little playful bites when there puppies but that is the worst they will do. And when they do playful bites it doesn’t hurt. It’s normal for all types of dogs to do playful bites when there puppies. But you don’t have to let them bite you. They only will try to do little playful bites if they see a dog toy or a dog treat they want Thats in your hand. Also if you try to hurt the dog it would do a playful bite because it wouldn’t want you to do that. But I know you wouldn’t try to hurt a dog. Sometimes after my dog wanted to do a playful bite my dog would actually start licking me instead! I hope this helps you. If you have any more questions you can ask me. Bye! Ok I am glad I can help you. bye! When I got my hair cut short, I got it donated too!